Blaise Tapp was last week’s individual top scorer in the newsquiz with an impressive 17 points. Michael Brown also scored 17 but had help from Chris Trevor Nelson and his remarkable Nicki Minaj knowledge. Dan Williams scored 14, as did Sophie Jamieson while Alex Murphy also got into double figures with 12. Here’s this week quiz. As usual there are 25 points to be won. Good luck … and let me know how you get on. 1. David Cameron’s description of migrants trying to reach Britain was condemned as ‘inflammatory,’ ‘incendiary’ and ‘disgraceful. What word did he use? Bonus: According to Eurotunnel how many migrants have died attempting to cross the Channel via the tunnel in the last month? Bonus: As a result of the chaos in Calais, thousands of lorries were held up in Operation Stack on which motorway? 2. Lord Sewel resigned from the House of Lords after being filmed allegedly taking drugs with prostitutes. Which newspaper broke the story? Bonus: Sewel was photographed reclining in a chair, smoking a cigarette and wearing a leather jacket and a bra. What colour was the bra? 3. Chris Froome became the first Briton to do what? 4. Which country invoked a rarely used article of Nato’s founding treaty to trigger a meeting about the threat of an ISIS terror attack? Bonus: Afghanistan's main intelligence agency announced that Taliban leader Mullah Omar was dead. In what year did it say he died? 5. Research released this week showed that black men are twice as likely to develop what disease than white men? 6. What was the name of the dentist who shot Cecil the Lion with a bow and arrow? Bonus: In which country did the killing take place? 7. Asda’s sales dropped 2.7 per cent in the 12 weeks to July 19, meaning it slipped from being Britain’s second biggest supermarket to third. Who overtook it to become second? 8. Which union announced that Jeremy Corbyn was its first choice as Labour leader and Yvette Cooper was its second? 9. Why did jockeys wear black armbands at Goodwood on Thursday? 10. Mohammed Ali, 31, was convicted at the Old Bailey of attempting to buy what on the Dark Web? 11. The head of the National Police Chiefs' Council Sara Thornton caused a stir by saying that in future police may not always investigate what sort of crime? 12. Who died this week after being in a coma since being found face down in a bathtub in January? 13. An aircraft wing section which is 'almost certainly' wreckage from Malaysia Airlines flight MH370 was washed up on which island? 14. The youngest contestant to appear on The Apprentice was found dead at his Isle of Man home this week. Name him. 15. How many Australian wickets did Jimmy Anderson take on the first day of the third test at Edgbaston? 16. A London museum intended to celebrate the culture and history of East End women was branded a 'sick joke' after it unveiled a gallery devoted to who? 17. Which country carried out its third execution in under three years, hanging former accountant Yakub Memon? 18. Which company announced it is cutting around 6,000 jobs despite reporting that profits were up 44 per cent to £656 million during the first half of 2015? 19. Former BBC Top Gear hosts Jeremy Clarkson, James May and Richard Hammond have signed a deal to present three seasons of a new motoring programme for which company? 20. Bookmaker William Hill suspended betting on who would sing the theme to the next Bond movie after a customer tried to put a £15,000 bet on which act? Well done to Janet Boyle who submitted a top score of 17 in last week's quiz. Damon Wake scored 14 and Alex Murphy 10. The Devon Demons (aka the Fleet family) scored 12, blaming a lack of beer and Prosecco and the Batstone collective, on the same score, blamed the distraction of cricket and golf. The McCulloch's (Ian and Gill) scored nine. Here's this week's quiz. As usual there are 25 points to be won. Let me know how you get on. 1. According to a YouGov poll Jeremy Corbyn has a first round lead in the Labour leadership contests with 43 per cent of the votes. Who did the poll say was last with only 11 per cent? Bonus: Tony Blair said that people who say their heart is with Corbyn should get what? Bonus: At an LBC Radio hustings, Corbyn was revealed as the only leadership candidate not to have done what? 2. At least 15 people were killed when a party boat, hired for a couple's engagement, crashed into a cargo vessel on which river? 3. A bag carrying one million New Zealand dollars (£425,000) went missing after it fell from a trailer while being moved at which airport? 4. Why was Laura Kuenssberg in the headlines? 5. Nicki Minaj had a Twitter spat with Taylor Swift over nominations for MTV’s best video award. What was Minaj’s video (which wasn’t nominated) called? Bonus: Apart from Taylor Swift, name one other artist whose video was nominated. 6. America’s Zach Johnson won the British open after a three-man play off. Name one of the other golfers in the play-off. Bonus: The play off took place after all three tied on how many strokes under par? 7. Comedian Simon Brodkin, aka Lee Nelson, was charged after he interrupted a FIFA press conference and threw dollar bills over Sepp Blatter. In which city? 8. How was British holidaymaker Kleyo de Abreu killed in Spain? 9. A 20-year-old suicide bomber killed 32 youth activists in which country? 11. Formula 1 driver Jules Bianchi was laid to rest in which city this week? Bonus: What car number is being retired by Formula 1 in honour of Bianchi? 12. Which company issued a warning that its chests and dressers were not safe unless anchored to a wall after two children were killed? 13. Ray Flynn, 80, is able to see again after taking part in the world’s first trial of ‘bionic eye’ technology at a hospital in which city? 14. The president, vice-chairman and adviser of which company quit after it was revealed it had overstated its operating profits by around £780m over several years? 15. Fragments dated as 1,370 years old which have been found at the University of Birmingham are believed to be from what manuscript? 16. Publishing group Pearson announced it is in 'advanced discussions' with an unnamed party over the sale of what? 17. Traffic disruption in Edinburgh was blamed on contractors cutting back 30ft leylandii hedges outside whose 17th-century mansion? 18. Courtney Stewart was branded a scumbag, questioned by police and assaulted on her doorstep after posting a picture of what on Facebook? 19. What did Nasa’s chief scientist, John Grunsfeld, call the newly discovered planet Kepler-452b? 20. What is the slogan used by cheating website Ashley Madison? Congratulations to Sophie Jamieson who submitted the highest score, 16, in last week’s newsquiz. She was narrowly ahead of The Subeditor who scored 15 and Alex Murphy with a consistent 14. Others in double figures included Frankie Taggart with 11. The top team effort was by the Batstones (Adam and Lucy) on 14. Here’s this week’s quiz … as usual 25 points to be had. Let me know how you get on. 1. A vote which was due to be held in Parliament on Wednesday was shelved at the last minute. What was the vote on? 2. Eurozone leaders agreed a bridging loan of how much on condition the Greek parliament passed reforms on taxation increases and pension curbs? Bonus: The Greek Parliament voted for the measures by 229 votes to 64 but how many of the Government’s MPs voted against? 3. Who said: 'It is incredibly inefficient to have a service that cranks up on a Monday morning [and] starts to wind down after lunch on a Friday’? 4. Why was Robin Lee arrested while travelling from Hackney to Camden? 5. Announcing he was determined to tackle the gender pay gap, David Cameron said that for every £1 a man earns in Britain a woman takes home how much? 6. Holly and Willow will be the last in what line? 7. How many Wimbledon singles titles has Serena Williams now won? Bonus: To which song did Novak Djokovic and Serena Williams perform their victory dance? 8. Nine police officers were injured and a car was lifted off an injured 16-year-old girl as protests broke out in which city? 9. Why was model Victoria Xipolitakis led away by security guards during the Pope’s visit to Paraguay? 10. Iran and six nations led by the United States agreed to significantly limit Tehran’s nuclear ability in return for lifting international oil and financial sanctions. In which city was the deal agreed? Bonus: Who described the deal as a 'bad mistake of historic proportions’? 11. The son of which rock star died after falling from a cliff in Brighton? 12. 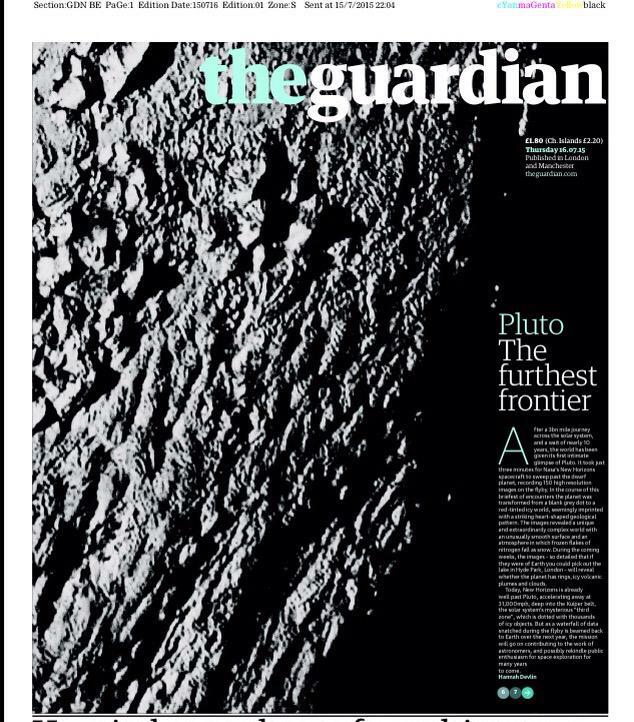 What was the name of the spacecraft that beamed back pictures of the surface of Pluto? 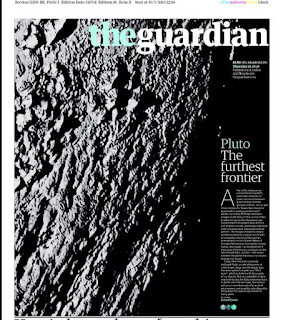 Bonus: Pluto lost its ‘planet’ status in 2006 and was categorised as a _______ planet. What is the missing word? 13. What offence was actress Amber Heard charged with? 14. What sold more than 105,000 copies in its first day on sale in the UK? 15. Why was Joaquin ‘El Chapo’ Guzman in the headlines? 16. Around 7.9 million people watched whose funeral this week? 17. Who was taken to hospital only days after renewing his wedding vows after 60 years of marriage? 18. Daniel Craig, Dame Judi Dench, Sir David Attenborough, JK Rowling and Gary Lineker were among 29 celebrities who signed a letter to David Cameron saying that ‘a diminished _____would simply mean a diminished Britain’. What is the missing word? 19. The second test against Australia began on Thursday at which ground? Bonus: The British Open also began on Thursday. At which golf course? 20. Grimsby Town football supporter Kenneth Meech was found guilty of assaulting a match steward with what? The top scorer in last week’s newsquiz was Michael Brown with a record-breaking 21. Too much time sitting in the sun reading newspapers he reckoned. Others in double figures were Alex Murphy and Damon Wake both with 14. Chris Lennon scored 12, pretty good considering he had been in Mexico all week. The top team score was by my mates in the pub with 19. Well done to them, especially on-fire Bryan Booth. The Batstone collective (Adam and Lucy) scored 17 amid a discussion that Wimbledon's #blackbragate story happened last year. Here are this week’s questions. As usual 25 points up for grabs. Good luck - and let me know how you get on. 1. Chancellor George Osborne announced in his Budget that the minimum wage for workers over 25 is to rise to how much from next April? Bonus: Who punched the air when the Living Wage was announced and later denied on radio that it was because he had taken viagra? Bonus: Two per cent of the UK’s national income is to be spent on what? Bonus: What is to be raised from £325,000 to £500,000 from April 2017? 2. Who scored a hat-trick in America’s Women’s World Cup victory over Japan? Bonus: What was the score in England’s third place match against Germany? 3. Euclid Tsakalotos replaced Yanis Varoufakis as what? Bonus: What is the Greek word for No? 4. Nick Robinson announced he is standing down as the BBC’s Political Editor. What is to be his new job? 5. Who has been accused of stealing water for his home by raiding a public hydrant? 6. Princess Charlotte was Christened at the church of St Mary Magdalene in which village? 7. Why was the M25 closed in both directions near Cobham Services in Surrey on Thursday afternoon? 8. What was delayed between the Belgian cities of Anvers and Huy? 9. Nineteen people were hurt when two double-decker buses crashed in which city? 10. 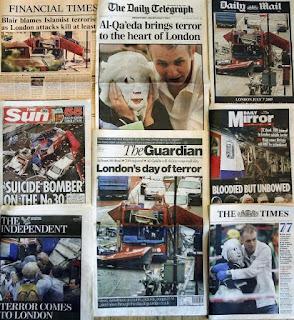 Emma Craig, a survivor of the 7/7 bombings, told a memorial service in Hyde Park that: 'It may not have broken London but it did break ___ ___ ___.' What are the missing three words? 11. 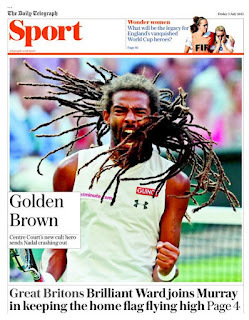 The men’s top three seeds all reached the semi-finals at Wimbledon along with the player seeded no 21. Name him. 12. Three public schoolboys from Victoria College have been arrested on the suspicion of the murder of a fellow pupil. Where? 13. Fox TV presenter Lisa Kennedy Montgomery was unrepentant after calling golfer Rory McIlroy what? 14. The BBC is to cover the costs of television licences for all British citizens over what age? 15. MP Simon Danczuk and his wife Karen went through a very public marriage breakdown. Which constituency does Mr Danczuk represent? 16. Dragons' Den's Peter Jones advised entrepreneurs not to do what? 17. How many runs did Joe Root score in England’s first innings against Australia in the opening Test at Cardiff? 18. According to Transport for London what rose from 16,000 to 30,000 during this week’s Tube strike? 19. Why were X Factor auditions in Manchester and London cancelled? 20. Who was carried off stage by security men after refusing to stop playing at the end of a five-hour set in Denmark? 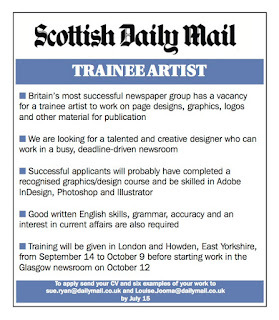 The Scottish Daily Mail has extended the deadline for applications for a trainee graphic artist. 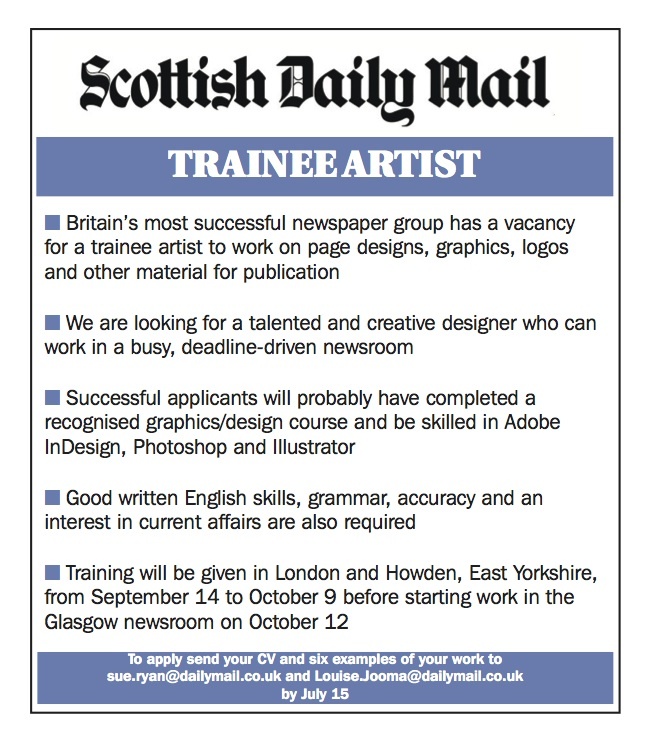 The paper is looking for a trainee to join its art desk in Glasgow. The successful applicant will create page layouts, information graphics and logos for the paper. It is likely they will have a recognised qualification in graphics and be skilled in InDesign and Photoshop. The deadline has now been extended to July 15. To apply send your CV and six examples of you work to sue.ryan@dailymail.co.uk and Louise.Jooma@dailymail.co.uk. Well done Damon Wake who scored 18 on his own in last week's quiz. Michael Brown also clocked up 18 but with the help of Claire and James Schofield in a sunny beer garden in Norfolk. The Batstones (Adam and Lucy) scored 18 too. Here is this week's quiz. As usual there are 20 questions with five bonuses. Let me know how you get on. 1. What was the name of the hotel in Sousse, Tunisia, where 38 people were killed? Bonus: A family of 12, who went missing on a trip to Bangladesh, have contacted relatives to say they are in Syria? Which British town are they from? 2. Name one of the three villages where homes would be demolished if the Heathrow expansion goes ahead. Bonus: When asked about the third runway at Heathrow, who said: ‘As it happens, I don't think my services as a bulldozer blocker will be required for decades, if ever.'? 3. Former Blue Peter presenter John Noakes was found in a storm drain after going missing for ten hours near his home on which island? 4. Eighty people were stranded on a monorail when two trains broke down. Where? 5. Dustin Brown, who knocked Rafael Nadal out of Wimbledon, had what world ranking at the start of the tournament? Bonus: Eugenie Bouchard escaped punishment despite apparently breaching Wimbledon's dress code. What did she do? Bonus: What did All England Lawn Tennis Club chairman Philip Brook give to the Duchess of Cornwall … who almost immediately gave him it back? 6. It was the hottest July in the UK since records began. The highest temperature was recorded at Heathrow airport. What was it? 7. Which company has agreed to pay £12 billion in damages - the largest paid by a single company in US history? 8. Who died at the age of 88 after, according to his daughter, his batteries just run out? 9. ATMs in Greece were restricted to pay out how much per day? Bonus: The Greek referendum on the bailout will be held on what day? 10. The first horse to regain the Cheltenham Gold Cup, and who also won a record five King George VI Chases, was put down after a fall. Name him. 11. Why was Laura Bassett in the headlines? 12. How many seconds were there in the last minute of June? 13. Which production was heckled and booed at the Royal Opera House in Covent Garden, London, for incorporating a scene in which a woman is stripped naked and molested by army officers? 14. The son and grandson of which shop's founder drowned after jumping into the sea to save a woman swept away by a wave in Ireland? 15. Which organisation announced it is cutting 1,000 jobs because of a shortfall of £150 million? 16. Sonia Manzano, who has played Maria for 44 years, is retiring from which TV show? 17. Sir Nicholas Winton, who died this week, famously organised the rescue of 669 children destined for Nazi concentration camps in 1939 from which city? 18. Headmistress Dr Rowena Blencowe has banned what from Trentham High School in Stoke? 19. What was the name given to a major counter-terror exercise in London on Tuesday? 20. What trapped eight people inside Alconbury Sports and Social Club in Cambridgeshire?